Water flow through plants is critical to our food supply: without proper water flow, plants cannot carry out photosynthesis, or grow or reliably produce flowers, fruit or seeds. Water flows within specialized structures from the roots, through the stem to the leaves, where its evaporation is regulated by microscopic pores called stomata. All the water-conducting structures are produced by tightly controlled developmental sequences: cells must divide to produce the necessary cell types in the correct place at the right time. But many details of how these complex developmental processes are controlled remain unclear. Osaka University researchers, in collaboration with laboratories in China, Germany, and Japan, have revealed a key piece in the jigsaw of mechanisms that control plant cell development. The team found that a peptide hormone is the signaling molecule that controls the development of two completely different types of cells, both of which are involved in creating the cellular structures for water flow. The hormone does this by binding to two distinct receptors in the two locations. The team recently published their findings in Nature Plants. The team used the small plant Arabidopsis (Thale cress), which grows and reproduces rapidly and has a smaller, simpler genome than most crop plants. Their research methods included genetic modification, studying the plant's anatomy by microscopy using fluorescent dyes, and producing mutant plants using the latest gene editing technologies. The researchers showed that the genes encoding the peptide hormone CLE9/10 are active in cells that lead to the development of stomata in the leaf and also in cells that are precursors of water-conducting vessels (the xylem) in the root. "In the primordial cells in leaves, binding of CLE9/10 to a protein receptor controls the number of stomatal pores," said lead author Pingping Qian. "But in the roots, it binds to a different protein receptor, and there it controls the production of xylem vessels." 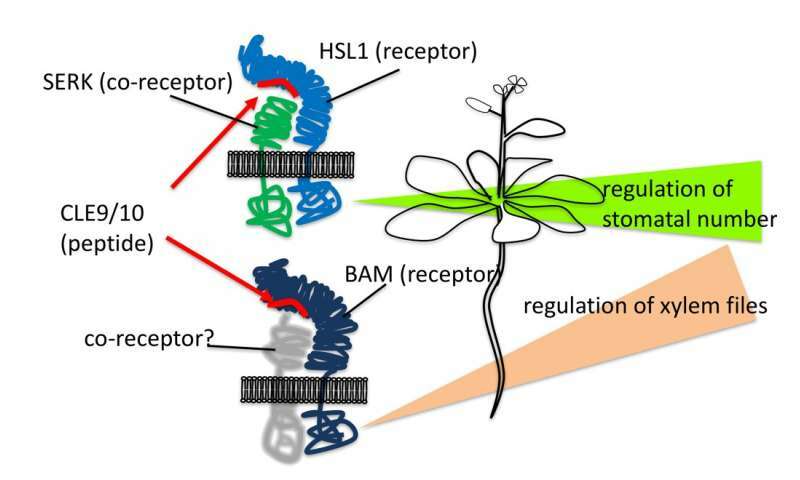 As well as identifying these two different receptors, the study also revealed that a co-receptor protein is involved in the leaf signaling system. "In animals, there are examples of signaling molecules that are perceived by multiple receptors," says corresponding author Tatsuo Kakimoto. "This study shows that the same types of signaling systems operate in plants. It is interesting that the two developmental processes, involving distinct receptors in different parts of the plant, generate completely different structures that are both essential for water flow. These results have implications for understanding how multiple processes in plant development are coordinated." Take a Small, unnecessary plant; Mess up its DNA little by little To destroy its systems 1 by 1. RECORD ALL OF Your & Their ACTIVITIES. Then, Bring Them all back up. They will NOT Complain....No Mouths in Plants ! Of course, ALL of it in their 1-Celled Zygote Stage.